Pseudoscience to forecast earthly and human events through the observation and interpretation of the stars, the Sun, the Moon, and the planets. 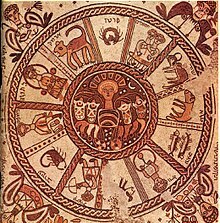 Astrology is a group of systems, traditions, and beliefs in which knowledge of the relative positions of celestial bodies and related details is held to be useful in understanding, interpreting, and organizing information about personality, human affairs, and other terrestrial matters. A practitioner of astrology is called an astrologer, or, less often, an astrologist. Such is the way of all superstition, whether in astrology, dreams, omens, divine judgments, or the like; wherein men, having a delight in such vanities, mark the events where they are fulfilled, but where they fail, though this happen much oftener, neglect and pass them by. That astrology is a science, and a coming science, is true. That astrology in its highest aspect and its true interpretation, will enable man eventually to focus his understanding, and to function rightly, is equally true... But that astrology is not yet to be found. Too much is overlooked and too little known, to make astrology the exact science that many claim it is. The claim will be fulfilled at some future date, but the time is not yet. The claims of the astrologers as to the reality of the energies playing upon the human organism, can be seen to be true; their claims as to their capacity to interpret, are for the most part unfounded. So little is really known... The energy of the particular constellation or sign in which a man is born, is more deeply significant than has ever yet been suggested. It embodies or indicates his present problem, sets the pace or tempo of his life, and is related to the quality of his personality. It governs, if I may so express it, the . . . activity aspect of his life during incarnation. Scientists refuse to study astrology, not because of prejudice or because there is a conspiracy afoot, but simply because there is not a shred of evidence that would justify the expenditure of valuable time from a career. Amusingly, it falls foul of our modern taboo against lazy stereotyping. How would we react if a newspaper published a daily columm that read something like this: "Germans: It is in your nature to be hard-working and methodical, which should serve you well at work today. In your personal relationships, especially this evening, you will need to curb your natural tendency to obey orders. Chinese: Inscrutability has many advantages, but it may be your undoing today. British: Your stiff upper lip may serve you well in business dealings, but try to relax and let yourself go in your social life." Richard Dawkins, The Enemies of Reason, "Slaves to Superstition" [1.01], 13 August 2007, timecode 0:05:54ff. And most people say of astrology, "Oh, it's harmless fun, isn't it?" And I should say probably for about 80% of the cases it probably is harmless fun, but there's a strong way in which it isn't harmless: one, because it's so anti-science; you know, you'll hear things like "Science doesn't know everything." Well, of course science doesn't know everything, but because science doesn't know everything that doesn't mean science knows nothing. Science knows enough for us to be watched by a few million people now on television, for these lights to be working, for quite extraordinary miracles to have taken place in terms of the harnessing of the physical world and our dim approaches towards understanding it. Stephen Fry, Room 101, Season 6 Episode 10. He considered horoscopes as silly as spectacles on a cow. The medieval addiction to astrology is not merely a sign of "failure of nerve". According to Aristotle, everything that happens in the sub-lunary world is caused and governed by the motions of the heavenly spheres. This tenet served as a rationale for the defenders of astrology, both in antiquity and the Middle Ages. ...In the absence of quantitative laws and causal relations, the Aristotelian... proceeded by deduction from analogies, which were often metaphorical, or allegorical, or purely verbal. Their [the stars] influence on our fate is considerably less than the influence of a banana peel, on which you can slip and break your leg. But there is no interest in banana peels, whereas serious periodicals include horoscopes ... It lifts his spirits. The whole universe revolves around him, and even if things aren't going well, even if the stars are lined up in such a way that the suspenders manufacturer loses his shirt and the individual consequently loses his job, it's still more comforting than to know that the stars don't really give a damn. Knock astrology out of his head, and the belief too that the cactus on his windowsill cares about him, and what is left? Barefoot, naked despair. Stanislaw Lem, Peace on Earth (1987), tr. Elinor Ford (1994) from Pojój na Zemi, Ch. 5. Astrology is a disease, not a science. Moses ben Maimon, 1135 to 1204, Jewish philosopher. With hollow shriek the steep of Delphos leaving. Inspires the pale-eyed priest from the prophetic cell. John Milton Hymn, stanza 19, line 173.
his goatish disposition to the charge of a star!